Despite my mom’s protest for me to do the contrary, I’m not the biggest consumer of fruits and vegetables. Though I’ve been told numerous time by modern medical science, television shows, books, and my parents that eating a balanced diet is good for my health and well-being, take one look at my fridge and the dozens of frozen burritos that currently inhabit it and you’ll know how serious I take this fruits and vegetables stuff. There are few fruits that I actually enjoy, but the ones I actually like, I buy and eat on a regular basis. That’s why it’s really annoying to see when one of them has to go on the do-not-eat list for a while. It’s at times like this where I wonder why I seem to have so few things left to enjoy in the world and why they all must be systematically taken away from me. 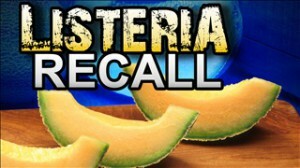 If you have hypochondriac tendencies like me, then you’ve no doubt already heard that between 1.5 million to 4.5 million cantaloupes, the most delicious orange fruit in the world, have been recalled because they may be linked to a deadly outbreak of listeria. The outbreaks has already resulted in the deaths of at least 16 people in over 18 states and over 70 reported cases of illnesses related to the bacteria. The company responsible for the tainted fruit is Jensen Farms, a producer and wholesaler of cantaloupe and other produce. The Centers for Disease Control expects more reports of deaths and illnesses related to listeria to come as the days go on since Jensen Farms apparently has no idea how much of their tainted fruit is out on the market since the company claims its fruit often gets resold and repackaged many times over, which I know is great news for all you cantaloupe lovers out there. And the best part is that according to the CDC, if you can’t figure out where your cantaloupe comes from, you shouldn’t eat it. This is wonderful because now I get to throw out twenty dollars worth of possibly poison fruit (I hope my sarcasm is conveying nicely to you). But what is liseria? A freaking terrible bacterial infection, that’s what. Also known as listeriosis, the infection is caused by a bacterium called Listeria monocytogenes and is usually spread through infected soil, water and animals. Like most bacteria, heat and pasteurization kills it, but unlike most bacteria, listeria can continue to grow and multiply at room temperature and even in the cold of your refrigerator. According to the CDC, it can live on any household surfaces it touches so cleaning anywhere a tainted cantaloupe touches is essential. Though listeria is usually only fatal in those with weaker immune systems like young children and the elderly, pregnant women can transmit the infection to their unborn children. And even if you don’t die from it, you can still get one of the nastiest cases of stomach flu you’ve ever had in your whole life from it. Fortunately though, it appears most healthy adults are immune from listeria’s effects (which means I’m probably out). There isn’t much good that we can take from this cantaloupe recall. But if you’re like me and see the glass as half full, you may be able to take this recent food bacteria outbreak as a reason why naysayers of chain of distribution-based product liability should shut up and thank the stars that the law is still in practice. Because without it, many injured consumers of cantaloupes in this case could’ve been without a leg to stand on. Product liability is a legal term we’ve all heard before. It basically allows us consumers to sue manufacturers for any harm we’ve suffered as a result of their defective products being released on the market. However, what some people may not realize though is that product liability law extends beyond just the maker of the bad product, but also to those who buy and resell said products. Meaning, that if you buy a tainted Jensen Farms cantaloupe that has been repackaged and sold as X brand cantaloupe from Y supermarket, you’d be able to recover from X and Y along with Jensen Farms. Why is this good? Though it sounds needlessly duplicative, in situations like this cantaloupe debacle where the harm and damage payout may be huge, as in possibly big enough to bankrupt a company, there may not be enough money to go around to all the victims if only the original manufacturer had to foot the bill for their initial mistake. This could potentially leave many injured parties without much compensation or a much longer time until they get their due. However, with chain of distribution product liability, each reseller also becomes responsible for paying out their fair share of the blame, so to speak. In this case and any others like it, this ensures that anyone who becomes sick from the tainted produce can recover for their harm. So, if you’ve become sick or worse from one of the tainted cantaloupes, rest assured that you have some legal footing to stand on. And if you haven’t been affected by this outbreak, take this as a lesson as why you shouldn’t eat fruit. Just joking about that last one. My mom would slap me in the face if I didn’t clarify to everyone that it was a joke. Fruit and vegetables are still our friends, alright mom? ?